When AJ Exteriors was incorporated in 2011, we started providing roofing as one of our main services. Currently, we serve to our potential customers in southwest and western Chicagoland suburbs. Family owned and operated, our company has learned how to cater to every consumer and the unique needs they have. We understand that your home is your castle; and you want your castle to have long lasting durability and appeal that stands out on your block. We acknowledge that no two homes are alike, and no two needs are exactly the same; so we come to you with an open ear to what your needs are. 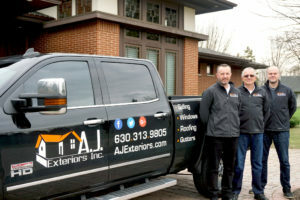 AJ Exteriors is the best residential renovation contractor to service your home! We strive to provide the best quality service to our past and future clients by using the industry’s leading brands. As a residential renovation contractor, we research and test all of our brands for our exterior contracting services. All of our products prove to have great performance and the best warranties. We also believe that it shouldn’t cost you an arm and a leg to have a new roof, siding or windows installed or replaced on your home. That’s why we try our best to provide the best prices and financial options for everyone’s needs. We are confident of our workmanship as a professional residential renovation contractor. We offer a 100% labor-warranty and stand behind the quality of the work we do; while delivering conscientious, elite customer service. So whether you are looking to update the exterior of your home, or weather calamity has hit your home, give us a call. We will walk you through your project start to finish. Our motto is simple – Providing quality service at affordable prices. It is with great honor the recognition of our hard work and dedication by renown supplier, Owens Corning™ . AJ Exteriors is now officially an Owens Corning™ Preferred Contractor! For Owens Corning™ to select a contractor for this accreditation is not easy. Check out the complete criteria list that a contractor must display to earn this recognition. For over 25 years we have been repairing and renovating various home structures, styles and conditions. We also have the experience and knowledge first-hand of the many harsh weather conditions specific to our region and how it affects our homes. This gives us a good understanding on the remedies needed for the various forms of damage. We stand behind our skills, hard work and professionalism while delivering elite customer service. Our confidence in our workmanship shows with our 100% labor warranty! OwensCorning™ trusts AJ Exteriors as a Preferred Contractor, which is why they guarantee our work with the Total Protection Guarantee! We understand how stressful it can be when dealing with damages to your home. To make the process convenient and less stressful for our customers, we work side-by-side with insurance claims specialist, Accurate Adjusting LLC. They are a public insurance adjusting company with their services including storm damage inspections, claims & solutions for homeowners. We are both here to assist in working with your insurance company, to get the money you deserve! Let us help assess your home’s damages and take care of the claims process for you. 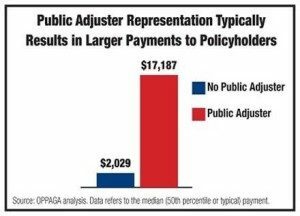 But don’t wait, because all policies only require insurance companies to be only responsible for storm damages up to a certain period of time. Give us a call – (630) 313-9805.